Manning is the county seat of Clarendon County. The town was established in 1855 and named for John Laurence Manning, governor of South Carolina from 1852 to 1854. 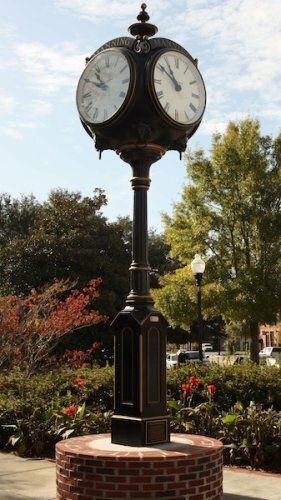 Its town clock is located on the northwest corner of Courthouse Square at the intersection of West Boyce Street and South Mill Street. A large portion of the original town, including the courthouse, was destroyed in 1865 during “Potter’s Raid.” A Confederate scout shot and killed one of General Edward Potter’s federal officers before Potter himself arrived in town. Some think this is the reason the US Army destroyed so much of Manning during that raid. The small agricultural community managed to prosper after the Civil War. By the 1900s, Manning had a tobacco market, a cannery, lumber mills, cotton gins, and a hotel. In the 1930s, Americans had fallen in love with the automobile. US 301, the North-South corridor between Baltimore and Florida, went right through Manning. Tourists stopped at local motor inns and enjoyed the ambiance of the small Southern town with antebellum homes shaded by large oak trees dripping with Spanish moss. Peggy Parish, author of the famous Amelia Bedelia children’s book series, was born and raised in Manning. A bronze statue of Amelia greets visitors at the entrance to library. Today, Manning has a population of just over 4,000.